At the Crossroads of Empire. 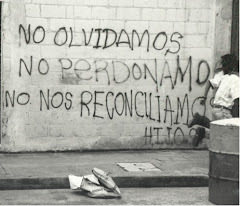 HIJOS: Sons and Daughters of the Disappeared and the struggle for NUNCA MAS in Guatemala. HIJOS is a human rights group that was established in 1999. It is made up of young people, many of them students, who were children when their parents were ''disappeared'', killed or massacred and have joined together recently, some of them returning from exile, to try and establish what happened to their parents and who was responsible for it. They also want to help educate the new generation in Guatemala about what happened during the years of repression. Please find a recent comunciado from HIJOS , who suffered an attack on the weekend. As we heard about recently, HIJOS and other organizations in Guatemala have succeeded in pressuring the government to not hold it's annual military parade this year, instead reclaiming the day as the National Day for the Heroes and Martyrs in Guatemala. Actions and events are being planned to celebrate the day in honour of loved ones. 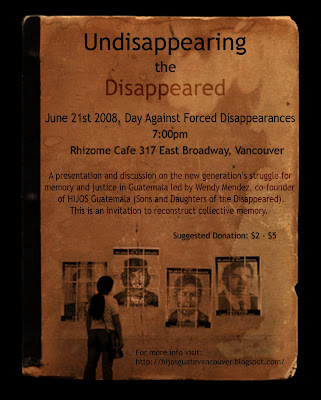 For 4 decades the Guatemalan Military has committed Genocide against the Guatemalan people. However, the annual military parade keeps on taking place in the streets of Guatemala City. We are calling you to join us in our effort to halt this celebrative parade and declared this day as Genocide Day. You can help us by sending the following Email to the President of the Republic of Guatemala, Alvaro Colom. 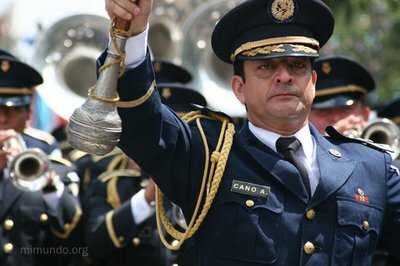 The Truth Commission that was established in Guatemala, as part of the peace agreements signed in 1996, concluded that Guatemalan Army Officials committed more than 80% of all the violations against human rights, during the decades of internal armed conflict. This is without mentioning the number of violations in which Guatemalan Army Officials were combined with other State authorities and also committed crimes against humanity. Today the survivors of genocide in Guatemala have opened a process against several high army generals involved in crimes against humanity during the internal armed conflict. As Canadian citizens and residents, in observance of the international human rights conventions against genocide that have been signed by both countries, we ask that you, as Head of State of Guatemala, stop the Military Parade that takes place every 30th of June. To celebrate an institution that committed genocide against its own people is considered to be one of the highest symbols of Impunity, militarization and a regression to the Guatemala’s recent past.